Marion Iowa April 7 / 19 Cary Club met with Mrs Waffle at the usual hour. Meeting was called to order by the Pres. Mrs McKean. Roll call responded by quotations on spring. Mrs Reichert acted as secty in the absence of Secty. Mrs Shumack. Mrs McKean gave her [illegible] and cotton as [illegible] for calendar and also substituted with a selected article. 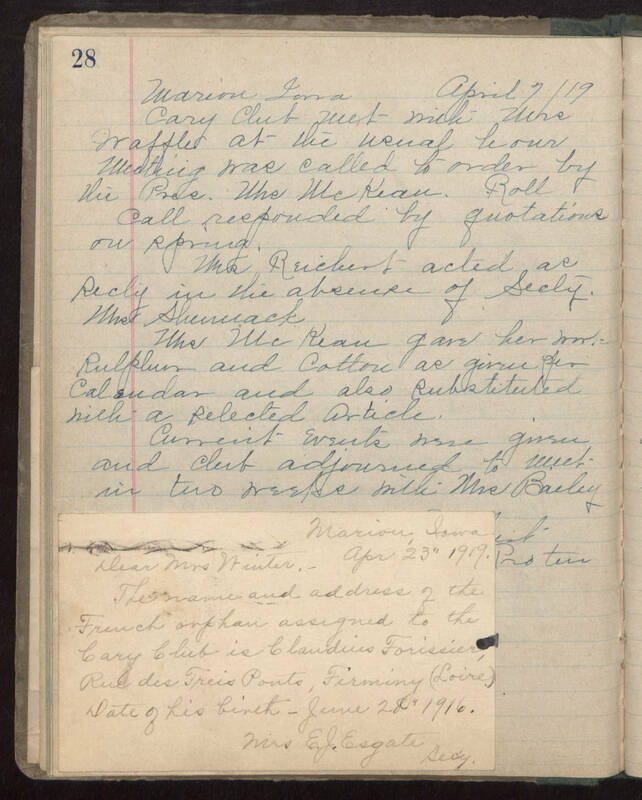 Current events were given and club adjourned to meet in two weeks with Mrs Bailey Marion, Iowa Apr 23" 1919. Dear Mrs.Winter:- The name and address of the French orphan assigned to the Cary Club is Caudius Forissier, Rue des Treis Ponts, Firminy (Loire) Date of his birth - June 22" 1916. Mrs. E. J. Esgate secy.